A lot of students don’t realize that they have other options their freshman year of college besides living in a dorm. Colleges make it seem like living in a dorm is the only option, and not just purely out of greed. It is the best for them if their students live in the dorms, but they probably believe on some level it is best for the students as well. That is why dorms were created in the first place. But the question is: is it really the best for students? Living in the dorms isn’t glamorous, but it has its positives as well. A student’s other options are living off campus, whether it be renting a room from a person with a house, or finding other students to live in an apartment with, or continuing to live at home with their family while commuting. The latter of course depends on your location. Unless you want to spurn the traditional college experience and instead opt for Rutgers Online, you will have to choose one. Before you can make this decision though, you have to know a little more about what living in the dorms is really like. 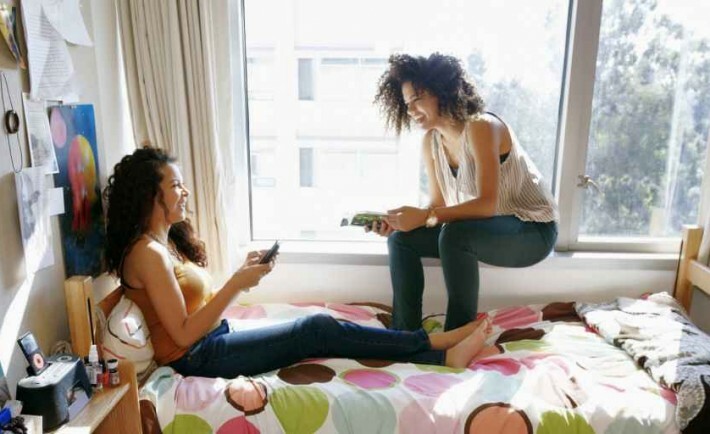 To start, here are the pros and cons of living in a college dorm. Part of the reason you will build those social relationships so easily is because there are literally people around you constantly when living in a dorm. You will have 2-3 roommates in a room that is probably smaller than your childhood bedroom, and share a bathroom with dozens of more people. It has its positives, but it is also exhausting and claustrophobia inducing. The other main reason people continue to live in dorms: it’s just plain easy. You don’t have to worry about finding roommates or finding an apartment, paying utilities, or repairs. Everything is put in place for you. You will also be living on campus, so you will be close to everyone and everything. Your classes, your meal hall, and your friends will all be a short walk away. One of the most exciting parts of moving out of your parent’s house is that you are no longer under their constant supervision. But because the dorms are a college sanctioned environment, the school can’t just let you all run wild and free. The dorms are heavily supervised.